Rialto Theater with the Streetcar. The Rialto Center for the Arts at Georgia State University is the cultural centerpiece of downtown, located in the heart of Atlanta’s historic Fairlie-Poplar district. 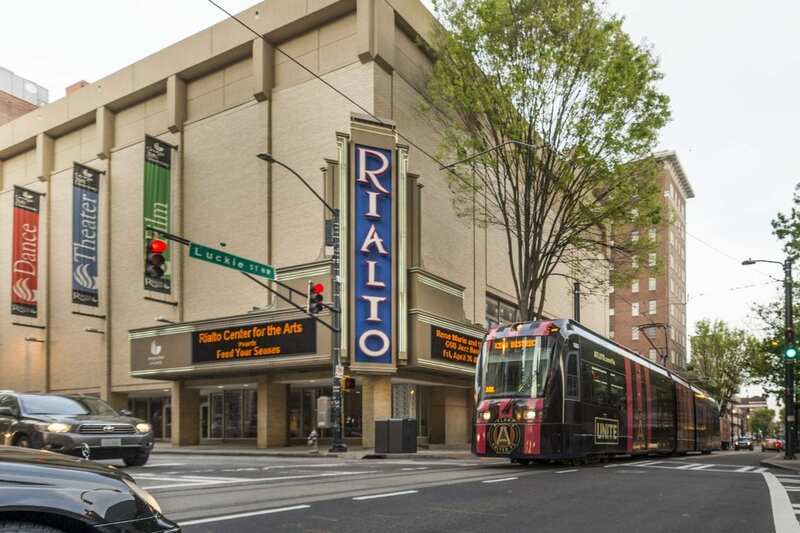 This year, the Rialto celebrates 100 years, a major milestone, as an anchor for the arts in downtown Atlanta. The Rialto is a cultural resource for Georgia State and the Atlanta community. Our mission is to inspire, educate and entertain diverse audiences by presenting innovative and exceptional arts programming and cultivating community partnerships. Our nationally renowned arts programming is carefully curated to appeal to diverse audiences and represent the widest possible array of artistic styles and genres. Our intimate, 833-seat performing arts venue is home to the Rialto Series, featuring the best of national and international jazz, world music and dance and Georgia State’s School of Music performances. It is the downtown go-to venue for other arts organizations’ performances, visiting companies and independent film screenings. Each year, the Rialto Center presents the Rialto Series, a unique subscription series featuring world-class artists, presenting an eclectic mix of world music, jazz, contemporary dance and international programs, as well as media arts. In addition, the Rialto offers innovative educational programs to students and the public. The Rialto has a fast-growing reputation as the arts center that brings once-in-a-lifetime cultural experiences to the Southeast and challenges patrons to expand their artistic worldview. The Rialto is proud to be part of Georgia State University in the heart of downtown Atlanta. Georgia State is a leading research institution of higher learning, ranked among the top “up and coming” national universities and among the country’s most diverse institutions. More than 53,000 students are enrolled annually on its six campuses, arriving from every county in Georgia, all 50 states and 159 countries. The Rialto continues to build its reputation as the place where Atlanta meets the world through its one-of-a-kind international programming, bringing together diverse communities and creating conversations about culture, art and history. The Rialto Center for the Arts at Georgia State University is an intimate, cultural centerpiece of downtown Atlanta. Our mission is to inspire, educate and entertain diverse audiences by presenting innovative and exceptional arts programming and cultivating community partnerships.